The Havanese coat is straight or wavy. This dog was often called the “Havana silk dog” because the coat, while double-coated, feels like fine silk. The adult coat reaches a length of six to eight inches. Unlike the bichon, the Havanese comes in many colors including gold, black, blue, silver, cream, champagne, chocolate and any combination of the acceptable colors including tricolor and parti-color. Havanese are affectionate and happy dogs. They do not make good kennel dogs and prefer being with their owners. They are active dogs and enjoy learning tricks and playing games with their owners. Havanese are intelligent and trainable. They need socialization to prevent them from becoming timid with strangers. Havanese need a large amount of interaction with people. They are generally good with other pets if properly socialized, and they enjoy outside activities. The Havanese can be a good watchdog but poor guard dog because of the small size. Occasionally, one may bark excessively if not properly trained. 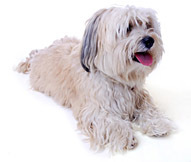 Havanese require brushing and combing three or more times a week to ensure a mat-free coat. They do not require trimming. The Havanese breed is ideal for a person who wants a small, active dog who does not require a large yard and can be contented with frequent walks and games of fetch. These dogs do not do well left alone for long periods. Havanese typically live from 10 to 15 years. The Havanese is an old breed from the bichon family. Originally, Tenerife dogs came to Cuba with Spanish farmers and noblemen in the early 1500s. These dogs developed into the Havanese with little, if any, outside influences. In Havana, the breed became a family pet. By the 18th century, Europeans vacationing in Havana discovered the Havanese. The little dog quickly became a hit among Spanish, French and British nobility. With Castro’s revolution, some Cubans who fled to the United States brought their Havanese with them. These 11 dogs became the foundation stock for the Havanese of today. The Havanese is the most recent admission to the American Kennel Club’s Toy Group.